Professional video and audio systems integration firm Advanced Broadcast Solutions (ABS) recently completed work on a video wall mural on the campus of Central Washington University, a four-year public university in Ellensburg, Wash. 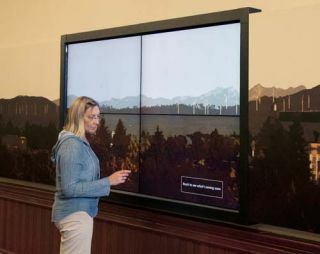 Located in Barge Hall, the university’s first building, which opened in 1894, the interactive video wall will showcase CWU’s growing list of distinguished faculty through photos and video clips. ABS recently installed a video wall mural at Central Washington University that will be used to highlight the university’s distinguished faculty through photos and video clips. Originally, the wall outside the university president’s office was lined with framed images of some of the university’s 101 distinguished faculty members from past and present. While certainly traditional, the display was not very dynamic. “We had this idea for a mural and we wanted to embed a video presentation in it,” explained Olga Mayer, digital artist at CWU. “The history of any university is very rich. So many photographs get tossed in the archives and we forget about those people." In June, ABS was faced with a hard deadline of the end of CWU’s fiscal year. ABS, which has worked on several projects with various departments at CWU in the past, completed the project within two weeks. Completing the video presentation, however, will take much longer. Under the direction of Linda Schactler, executive director of CWU Office of Public Affairs, content for the presentation is currently being collected. Part of the appeal of the interactive mural is that faculty lectures, projects, and even musical performances can be included in each faculty member’s profile template.